This page lists various unique items and faction-specific items available in Skyrim. These items are generally found in fixed locations, unlike most equipment in the game, which is randomly generated, generic equipment (see Generic Magic Apparel and Generic Magic Weapons). Some of these items can be improved through smithing. Improving enchanted items requires the Arcane Blacksmith perk. For more information, see the Aegisbane article. Angi's Bow is a hunting bow given to Angi by her now deceased family. Tempering Angi's Bow requires one steel ingot, with the improvements being twice as effective should you have the Steel Smithing perk. For more information, see the Angi's Bow article. 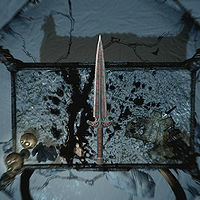 The Blade of Sacrifice is a ceremonial ebony dagger given to you by a Priestess of Boethiah as part of Boethiah's Calling. She will give the dagger with the intention that you use it to kill a follower on the Altar of Sacrifice located at the Sacellum of Boethiah, as part of a ritual to summon the Daedric Prince. Although the priestess will say you must use this ritualistic weapon to complete the ceremony, any weapon may be used. Tempering this dagger requires one ebony ingot. The Blade of Sacrifice cannot be enchanted. For more information, see the Blade of Sacrifice article. 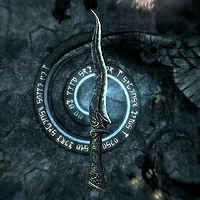 The Blade of Woe is a unique dagger belonging to Astrid, the leader of the only remaining Dark Brotherhood group in Skyrim. It can be received in three ways: pickpocketing from Astrid, killing Astrid during the Quest With Friends Like These..., or at the end of the quest Death Incarnate. For more information, see the Blade of Woe article. For more information, see the Bloodcursed Elven Arrow article. For more information, see the Bloodthorn article. For more information, see the Bolar's Oathblade article. 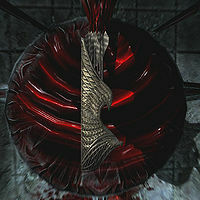 Borvir's Dagger is the weapon found besides its late eponymous owner, Borvir, inside Journeyman's Nook. 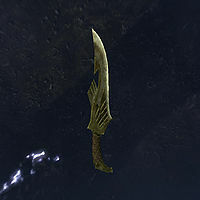 Its appearance and stats are identical to those of an elven dagger, only being notable due to its unique name and owner. As with all elven daggers, it requires one refined moonstone to temper, with the benefits of the tempering being doubled with the Elven Smithing perk. For more information, see the Borvir's Dagger article. For more information, see the Bow of the Hunt article. A Dragon Priest Dagger is a type of dagger associated with the Dragon Cult. They can be found in the Hall of Countenance, Volunruud Elder's Cairn, Volkihar KeepDG, and Ysgramor's Tomb. This weapon may also be wielded by dragon cultists in Forelhost. It cannot be tempered. For more information, see the Dragon Priest Dagger article. 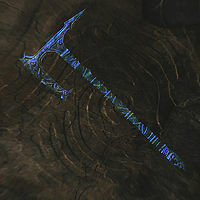 A Drainblood Battleaxe is a translucent Honed Ancient Nord Battle Axe wielded by some of the ghostly draugr found within Labyrinthian. It is a part of a set of similar phantom weapons, alongside the Drainheart Sword and Drainspell Bow. Its physical appearance would be identical to the mundane version of this weapon were it not for its spectral look and the particles that flow out of it while moving with it equipped. A Drainblood Battleaxe is enchanted to absorb health for fifteen points upon hit. It is not possible to improve this weapon. For more information, see the Drainblood Battleaxe article. 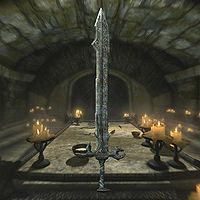 A Drainheart Sword is a translucent Honed Ancient Nord Sword wielded by some of the ghostly draugr found within Labyrinthian. It is a part of a set of similar phantom weapons, alongside the Drainblood Battleaxe and Drainspell Bow. Its physical appearance would be identical to the mundane version of this weapon were it not for its spectral look and the particles that flow out of it while moving with it equipped. A Drainheart Sword is enchanted to absorb stamina for fifteen points upon hit over a period of a second. It is not possible to improve this weapon. For more information, see the Drainheart Sword article. 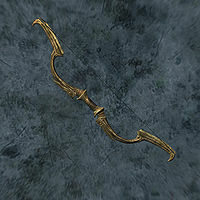 A Drainspell Bow is a translucent Supple Ancient Nord Bow wielded by some of the ghostly draugr found within Labyrinthian. It is a part of a set of similar phantom weapons, alongside the Drainblood Battleaxe and Drainheart Sword. Its physical appearance would be identical to the mundane version of this weapon were it not for its spectral look and the particles that flow out of it while moving with it equipped. A Drainspell Bow is enchanted to absorb Magicka for fifteen points upon hit. It is not possible to improve this weapon. For more information, see the Drainspell Bow article. For more information, see the Eduj article. 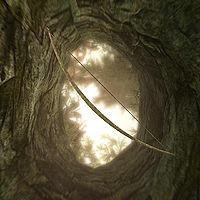 Firiniel's End is an elven bow that is left in a convenient location to perform the assassination of Vittoria Vici during her wedding by Gabriella, as part of Bound Until Death. 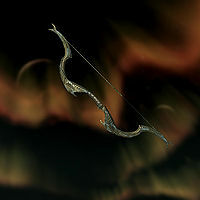 The bow is enchanted to do twenty points of frost damage upon strike, while also slowing the target by fifty points for three seconds. Tempering Firiniel's End requires an ingot of refined moonstone, as well as the Arcane Blacksmith perk. Any improvements to the weapon from the use of a grindstone are doubled if the Elven Smithing perk is also unlocked. For more information, see the Firiniel's End article. 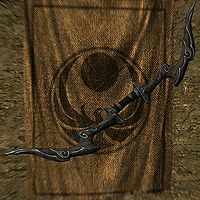 Froki's Bow is a long bow that was made by and was the weapon of choice of Froki Whetted-Blade that he lost within Graywinter Watch. The bow has an enchantment that does ten points of stamina damage. Tempering Froki's Bow requires an iron ingot and the Arcane Blacksmith perk. For more information, see the Froki's Bow article. 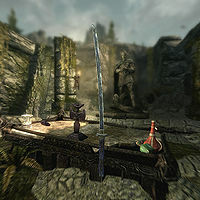 Ghostblade is a translucent Ancient Nord Sword given to you by the spirits of Fjori and Holgeir as a reward for freeing them from the control of Lu'ah Al-Skaven, as part of the quest Ansilvund. The weapon is enchanted to do three extra points of damage that ignore the target's armor, without needing to be charged through soul gems. It is also extremely lightweight, and thus requires very little Stamina for power attacks. Tempering Ghostblade requires three samples of ectoplasm, as well as the Arcane Blacksmith perk. For more information, see the Ghostblade article. 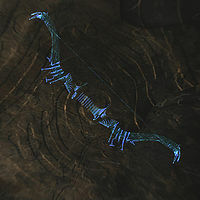 Karliah's Bow is the version of the Nightingale Bow used by NPCs, such as Karliah and Nightingale Sentinels. It shares its appearance with the player version, although it lacks its enchantment and is worth less gold. Curiously, this version of the weapon does more damage, weighs less, and is faster than the highest leveled version of the player's bow. 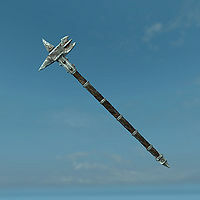 The characters who have a copy of this weapon will never drop it, meaning it cannot be obtained during normal gameplay. For more information, see the Karliah's Bow article. 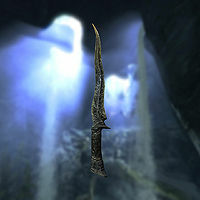 Nettlebane is a unique, crudely-engraved ebony dagger, originally made by hagravens to sacrifice spriggans. 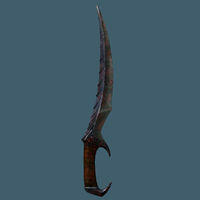 Compared to the typical ebony dagger, Nettlebane compares unfavorably. 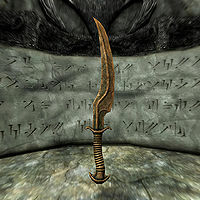 It weighs twice what a normal ebony dagger would, does four points less damage, and is worth nowhere near as much gold. Furthermore, it can't even be enchanted, making it fairly worthless outside of its related quest. The only way to improve upon this weapon is tempering it with an ebony ingot, although it does not benefit from the Ebony Smithing perk. For more information, see the Nettlebane article. 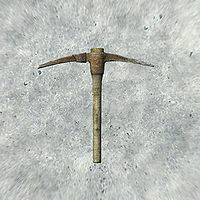 The Notched Pickaxe is a special pickaxe found stuck into the peak of the Throat of the World. It has the unique enchantment Smithing Expertise, which boosts the Smithing skill while it is equipped, and does five points of shock damage when it is used as a weapon. Tempering the Notched Pickaxe requires an iron ingot and the Arcane Blacksmith perk. For more information, see the Notched Pickaxe article. 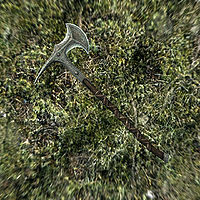 Okin is a Nord Hero War Axe that served as one of favored weapons of the Nord warrior Kvenel the Tongue, alongside the Nord Hero Sword Eduj. Okin can be found in the possession of its owner within his tomb, Volunruud. The weapon itself comes with an enchantment that does ten points of frost damage and slows the target by fifty points for three seconds. Tempering Okin requires a steel ingot and the Arcane Blacksmith perk, with the benefits of the improvements being doubled if the steel smithing perk is unlocked. For more information, see the Okin article. The Poacher's Axe is a special woodcutter's axe that is found within Halted Stream Camp. It has the unique enchantment Huntsman's Prowess, which does an additional three points of damage to animals. Tempering the Poacher's Axe requires a steel ingot. 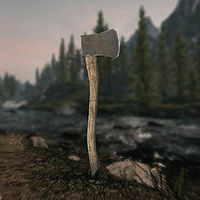 While it has a unique enchantment and name, the Poacher's Axe can still be used to chop wood like a normal woodcutter's axe. For more information, see the Poacher's Axe article. 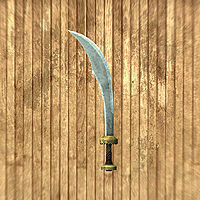 Rundi's Dagger is the weapon found besides its late eponymous owner, Rundi, east-southeast of Winterhold. 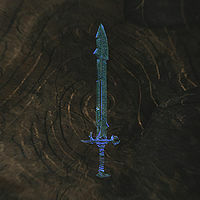 Its appearance and stats are identical to those of a steel dagger, only being notable besides due to its unique name and owner. As with all steel daggers, it requires one steel ingot to temper, with the benefits of the tempering being doubled with the Steel Smithing perk. For more information, see the Rundi's Dagger article. 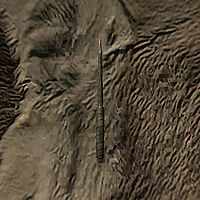 A Shiv is an improvised dagger-like weapon, commonly made and used by the prisoners of Cidhna Mine. These sharpened utensils are the only handily available weapon in the prison, excluding fists and magic. Due to its improvised nature, a shiv cannot be improved. For more information, see the Shiv article. The Steel Battleaxe of Fiery Souls is a unique steel battleaxe located on the back of Warlord Gathrik's throne in Ironbind Barrow. Its unique enchantment does ten points of fire damage over one second, and soul traps the target for five seconds. Tempering this weapon requires a steel ingot as well as the Arcane Blacksmith perk. Improvements to the weapon are doubled if the Steel Smithing perk is also unlocked. 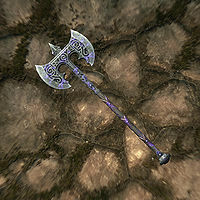 Like other weapons with fire enchantments, this battleaxe benefits from the Augmented Flames perk and will inflict 15 points of fire damage at the 2nd level. For more information, see the Steel Battleaxe of Fiery Souls article. A Sunhallowed Elven Arrow is an elven arrow that has been blessed by Knight-Paladin Gelebor. 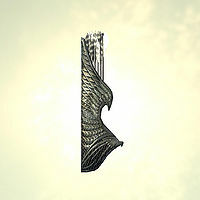 The arrows are visually similar to the elven arrows that are needed to create them, with a gray shaft instead of a golden one, and the fletchings alternating between gray and white. The quiver is similar, being a more pallid color compared to the strong golden one of normal arrows. When fired at the sun during the day with Auriel's Bow, it will cause a sunburst, doing damage to any target caught in the blast, with undead taking triple damage. It is the contemporary and counterpart of the Bloodcursed Elven Arrow. For more information, see the Sunhallowed Elven Arrow article. Rahd's hammer, the reduced weight allows it to be swung more quickly. 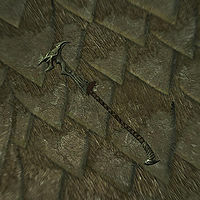 The Longhammer is a unique Orcish warhammer that belonged to the bandit Rahd before he was killed during a Falmer attack as part of the related quest. It can be recovered from the Breton's dead grasp within Liar's Retreat. Compared to the standard Orcish warhammer, the Longhammer weighs eight units less, while also having half the base value of the normal version. The true value of the weapon is its speed, as it has the same swinging speed as a mace. While it lacks an enchantment, one can be added after acquiring it to further improve its worth. Tempering this weapon requires an orichalcum ingot, with any improvements made being doubled if the Orcish Smithing perk is also unlocked. For more information, see The Longhammer article. The Woodsman's Friend is a unique iron battleaxe found alongside a dead wood cutter. With no enchantment and no way to improve the weapon through blacksmithing, the only advantage this weapon has over the generic version of this weapon is the single extra point of default damage it can do. However, as the weapon has a lower speed, the overall benefit of this extra point of damage is diminished. 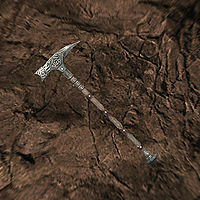 Additionally, it has approximately half of the gold value of a normal iron battleaxe, making it notably subpar stat-wise to the standard version of this item. For more information, see The Woodsman's Friend article. 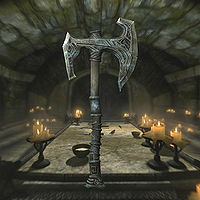 Trollsbane is a steel warhammer and the signature weapon of Frofnir Trollsbane before he was slain inside a troll's lair between Cradle Stone Tower and Valthume. Its enchantment has the unique property to do fifteen points of fire damage to any troll it hits, although it will have no effect against any other kind of creature. Tempering Trollsbane requires a steel ingot and the Arcane Blacksmith perk, with the improvement from the tempering being doubled if the Steel Smithing perk is also unlocked. For more information, see the Trollsbane article. 25% chance of a critical hit. 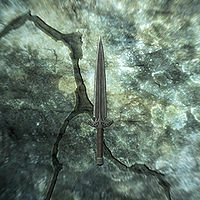 Valdr's Lucky Dagger is a unique steel dagger given by the eponymous Valdr as a reward for helping him clear out Moss Mother Cavern, as part of its related quest. Its enchantment increases the chance of a critical hit by 25%. As the weapon's enchantment is not one in the traditional sense, it will last indefinitely. Tempering this weapon requires a steel ingot, with the benefits of tempering being doubled if the Steel Smithing perk is unlocked. For more information, see the Valdr's Lucky Dagger article. For more information, see the Windshear article. 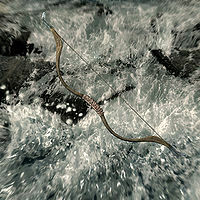 Zephyr is a unique Dwarven bow that belonged to Katria before she fell down a cliff to her death inside of Arkngthamz. The bow itself rests at the top of a ravine, precariously perched on the side of a fallen tree. Zephyr's unique enchantment gives it a much higher draw speed than regular Dwarven bows, making it one of the quickest bows available, alongside Auriel's Bow and the long bow. Zephyr can be further improved with a Dwarven metal ingot if the Arcane Blacksmith perk is unlocked, with the benefits of these alterations being doubled if the Dwarven Smithing perk is also unlocked. For more information, see the Zephyr article. The Ancient Helmet of the Unburned is a unique Ancient Nord Helmet. 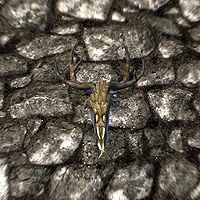 It is located behind a locked gate in Labyrinthian, Tribune. Its enchantment increases fire resistance by forty percent. Tempering this helmet requires an iron ingot and the Arcane Blacksmith perk, with the improvements doubling if the Daedric Smithing perk is also unlocked. For more information, see the Ancient Helmet of the Unburned article. Ancient Shrouded Armor is the chest piece of a set of armor found on a dead assassin in Hag's End. Alongside this piece, this set of armor also includes boots, a cowl, and gloves. It shares its appearance with regular Shrouded Armor. However, Ancient Shrouded Armor has a superior armor rating, lower weight, and higher gold value than the normal version of this armor. Additionally, this armor's enchantment provides 100% of poison resistance, versus the 50% of the common variant. Tempering Ancient Shrouded Armor requires a piece of leather and the Arcane Blacksmith perk. For more information, see the Ancient Shrouded Armor article. 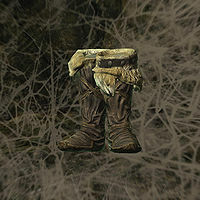 Ancient Shrouded Boots are the boots for a set of armor found on a dead assassin in Hag's End. Alongside this piece, this set of armor also includes an armor piece, a cowl, and gloves. It shares its appearance with regular Shrouded Boots. However, Ancient Shrouded Boots have a superior armor rating, lower weight, and higher gold value than the normal version of this armor. This armor's enchantment provides half a point of muffling, the same as the common version. Tempering Ancient Shrouded Boots requires a piece of leather and the Arcane Blacksmith perk. For more information, see the Ancient Shrouded Boots article. Ancient Shrouded Cowl is the head piece for a set of armor found on a dead assassin in Hag's End. Alongside this piece, this set of armor also includes an armor piece, a pair of boots, and gloves. It shares its appearance with regular Shrouded Cowl. However, the Ancient Shrouded Cowl has a superior armor rating, lower weight, and higher gold value than the normal version of this armor. This armor's enchantment fortifies archery by 35 points, fifteen points more than the common version. Tempering the Ancient Shrouded Cowl requires a piece of leather and the Arcane Blacksmith perk. For more information, see the Ancient Shrouded Cowl article. Ancient Shrouded Gloves are the gloves for a set of armor found on a dead assassin in Hag's End. Alongside this piece, this set of armor also includes an armor piece, a pair of boots, and a cowl. It shares its appearance with regular Shrouded Gloves. However, Ancient Shrouded Gloves have a superior armor rating, lower weight, and higher gold value than the normal version of this armor. This armor's enchantment provides double damage when backstabbing, the same as the common version. Tempering Ancient Shrouded Gloves requires a piece of leather and the Arcane Blacksmith perk. For more information, see the Ancient Shrouded Gloves article. 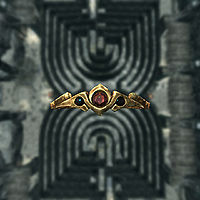 The Diadem of the Savant is a unique circlet that serves as the reward for conquering Shalidor's Maze, although a respawnable version can also be found outside of Froki's Shack (see bugs). As would be expected for an item associated with Shalidor, the circlet makes it so that all spells cost a lower amount of magicka to use. While it may be useful to mages due to its enchantment and since it can be worn without disabling the Mage Armor perk, its defensive capabilities cannot be improved further as it cannot be tempered. For more information, see the Diadem of the Savant article. For more information, see the General Tullius' Armor article. Gilded Wristguards are unique gauntlets located inside The Katariah, inside the Emperor's Quarters. As it is located upon The Katariah, they cannot be acquired until the related quest Hail Sithis! has been started. Obviously, this means that the item is unobtainable if you choose to do the quest Destroy the Dark Brotherhood! instead. Being regal attire, these golden wristguards are detailed with looping gold patterns. For more information, see the Gilded Wristguards article. 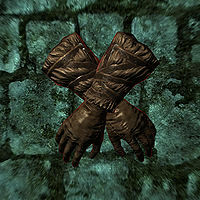 Gloves of the Pugilist are unique gloves located inside of the sewer tunnels beneath Riften known as The Ratway. Specifically, the Gloves of the Pugilist are found on the appropriately named Gian the Fist, who uses them for their unique fortify unarmed damage enchantment, which increases the damage unarmed strikes do by ten points. The gloves themselves share their appearance with fur gauntlets, along with its base stats. Unlike fur gauntlets, the improvements available through the use of a workbench require two leather strips, a piece of leather, and the Arcane Blacksmith perk, versus just a single piece of leather. For more information, see the Gloves of the Pugilist article. 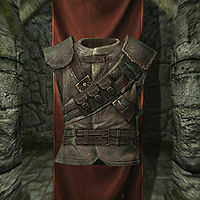 The Guild Master's Armor is the chest piece of the unique set of equipment given to the Guild Master of the Thieves Guild, and is the quest reward for completing Under New Management. Alongside this item, this set of equipment includes boots, gloves, and a hood. Its appearance is similar to that of the Thieves Guild Armor for the regular members, except for its darker color and additional badges to distinguish the rank associated with the armor. As it is essentially an upgrade to the regular set of guild armor, this armor has a superior armor rating and gold value to the basic set, although it weighs more. Like its similar appearance, this armor also has a correlative, yet more powerful, enchantment to the more common version of this armor. The armor fortifies carry weight by 50 points, versus 20 points for normal Thieves Guild Armor and 35 points for the upgraded version. Tempering this item requires a piece of leather and the Arcane Blacksmith perk, and also requires that the related quest be completed. For more information, see the Guild Master's Armor article. 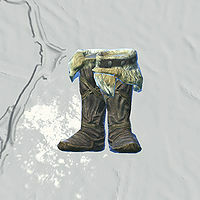 The Guild Master's Boots serve as the foot protection for the unique set of equipment given to the Guild Master of the Thieves Guild, and is part of the quest reward for completing Under New Management. Alongside this item, this set of equipment includes armor, gloves, and a hood. 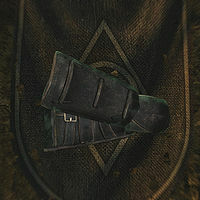 Its appearance is similar to that of the Thieves Guild Boots used by the regular members, except for its darker color. As it is essentially an upgrade to the regular set of guild armor, these boots have a superior armor rating and gold value to the basic set, although it weighs more. Like its similar appearance, the Guild Master's Boots also have a correlative, yet more powerful, enchantment to the more common version of this equipment. 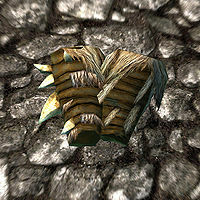 The boots fortify pickpocket ability by 35 points, versus 15 points for normal Thieves Guild Boots and 25 points for the upgraded version. Tempering this item requires a piece of leather and the Arcane Blacksmith perk. For more information, see the Guild Master's Boots article. 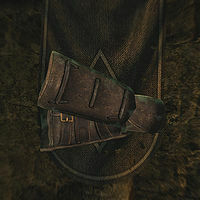 The Guild Master's Gloves are the gauntlets for the unique set of equipment given to the Guild Master of the Thieves Guild, and is part of the quest reward for completing Under New Management. Alongside this item, this set of equipment includes armor, boots, and a hood. Its appearance is similar to that of the Thieves Guild Gloves used by the regular members, except for the darker color for the leather, and the buckle made out of a lighter metal. As it is essentially an upgrade to the regular set of guild armor, these gloves have a superior armor rating and gold value to the basic set, although it weighs more. Like its similar appearance, the Guild Master's Gloves also have a correlative, yet more powerful, enchantment to the more common version of this equipment. 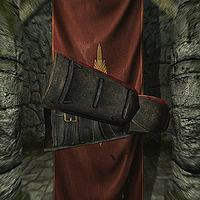 The gloves fortify lockpicking ability by 35 points, versus 15 points for normal Thieves Guild Gloves and 25 points for the upgraded version. Tempering this item requires a piece of leather and the Arcane Blacksmith perk. For more information, see the Guild Master's Gloves article. The Guild Master's Hood is the headwear for the unique set of equipment given to the Guild Master of the Thieves Guild, and is part of the quest reward for completing Under New Management. Alongside this item, this set of equipment includes armor, boots, and gloves. 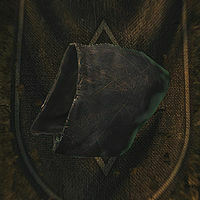 Its appearance is similar to that of the Thieves Guild Hood used by the regular members, except for its darker color. As it is essentially an upgrade to the regular set of guild armor, this hood has a superior armor rating and gold value to the basic set, although it weighs more. Like its similar appearance, the Guild Master's Hood also has a correlative, yet more powerful, enchantment to the more common version of this equipment. The hood fortifies barter ability by twenty points, versus ten points for normal Thieves Guild Hood and fifteen points for the upgraded version. Tempering this item requires a piece of leather and the Arcane Blacksmith perk. For more information, see the Guild Master's Hood article. 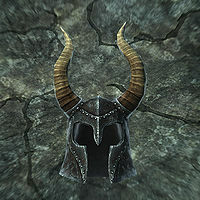 The Helm of Yngol is a unique helmet that belonged to Yngol, one of the original members of the Companions. After his death, he and his helmet were locked away in Yngol Barrow. The helm itself provides its wearer with a thirty percent increase to frost resistance. Tempering the Helm of Yngol requires a steel ingot and the Arcane Blacksmith perk, with the benefits of the alterations doubling if the Advanced Armors perk is also unlocked. For more information, see the Helm of Yngol article. For more information, see the Ironhand Gauntlets article. 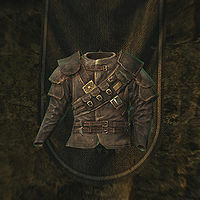 Linwe's Armor is the chest piece of the unique set of equipment used by the leader of the Summerset Shadows, Linwe. Alongside this item, this set of equipment also includes a pair of boots, gloves, and a hood. As Linwe runs an organization that rivals the Thieves Guild, his equipment has some visual similarities to the versions used by the Thieves Guild. Compared to Thieves Guild Armor, Linwe's Armor is grayer in color, but also sleeveless. Additionally, while it weighs one more unit than the Thieves Guild Armor, it also provides an additional two points of armor. However, its gold value is significantly lower. Besides that, the basic designs are the same. The armor is enchanted to fortify stamina by fifteen points. Tempering Linwe's Armor requires a piece of leather and the Arcane Blacksmith perk. For more information, see the Linwe's Armor article. 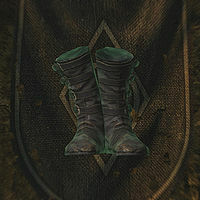 Linwe's Boots serve as the foot protection for the unique set of equipment used by the leader of the Summerset Shadows, Linwe. Alongside this item, this set of equipment also includes armor, a pair of gloves, and a hood. As Linwe runs an organization that rivals the Thieves Guild, his equipment has some visual similarities to the versions used by the Thieves Guild. Compared to Thieves Guild Boots, Linwe's Boots are grayer in color. Additionally, while his boots weigh half a unit more than the Thieves Guild Boots, it also provides an additional two points of armor, as well as being worth several hundred more gold pieces. Besides that, the basic designs of the items are the same. The armor is enchanted to fortify sneaking by fifteen points. Tempering Linwe's Boots requires a piece of leather and the Arcane Blacksmith perk. For more information, see the Linwe's Boots article. 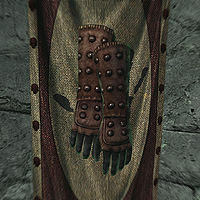 Linwe's Gloves serve as the gauntlets for the unique set of equipment used by the leader of the Summerset Shadows, Linwe. Alongside this item, this set of equipment also includes armor, a pair of boots, and a hood. As Linwe runs an organization that rivals the Thieves Guild, his equipment has some visual similarities to the versions used by the Thieves Guild. Compared to Thieves Guild Gloves, Linwe's Gloves are grayer in color. Additionally, while his gloves weigh one unit more than the Thieves Guild Gloves, it also provides an additional two points of armor, as well as being worth several hundred more gold pieces. Besides that, the basic designs of the items are the same. The armor is enchanted to fortify one-handed attacks by fifteen points. Tempering Linwe's Gloves requires a piece of leather and the Arcane Blacksmith perk. For more information, see the Linwe's Gloves article. 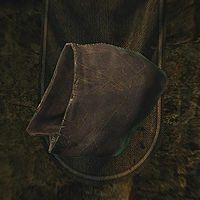 Linwe's Hood is the headwear for the unique set of equipment used by the leader of the Summerset Shadows, Linwe. Alongside this item, this set of equipment also includes armor, a pair of boots, and a gloves. As Linwe runs an organization that rivals the Thieves Guild, his equipment has some visual similarities to the versions used by the Thieves Guild. However, his hood is the exception to the rest of the equipment. 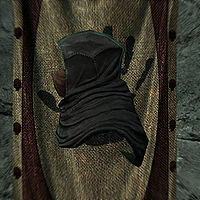 While a Thieves Guild Hood is a brown and rounded at the corners, this hood has much sharper appearance, is more patchwork than the Thieves Guild version, and is also gray. Additionally, while his hood weighs half a unit more than the Thieves Guild Hood, it also provides an additional three points of armor, as well as being slightly more valuable. The armor is enchanted to fortify Archery attacks by fifteen points. Tempering Linwe's Hood requires a piece of leather and the Arcane Blacksmith perk. For more information, see the Linwe's Hood article. 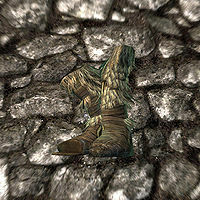 Movarth's Boots are a set of hide boots owned by the vampire Movarth Piquine. The boots can be found in their owner's lair, in the northeastern portion of the cave, next to a bed. They have been enchanted to improve sneaking by fifteen points while worn. For more information, see the Movarth's Boots article. The Armor of the Old Gods is a special version of Forsworn Armor given to you by Kaie for helping the leader of the Forsworn, Madanach, escape Cidhna Mine. Alongside the chest piece, this armor set also includes a pair of boots, gauntlets, and a helmet. This item shares its appearance with basic Forsworn equipment, weighs half as much, offers two fewer points of armor, and is considerably more valuable. The Armor of the Old Gods has also been enchanted to fortify destruction spells by fifteen points. Tempering this item requires a piece of leather and the Arcane Blacksmith perk. For more information, see the Armor of the Old Gods article. 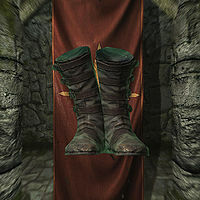 The Boots of the Old Gods are a special version of Forsworn Boots given to you by Kaie for helping the leader of the Forsworn, Madanach, escape Cidhna Mine. Alongside these shoes, this armor set also includes a chest piece, a pair of gauntlets, and a helmet. This item shares its appearance with basic Forsworn equipment, although it weighs half a point less, and is considerably more valuable. The Boots of the Old Gods have also been enchanted to fortify sneaking by twenty points. Tempering this item requires a piece of leather and the Arcane Blacksmith perk. For more information, see the Boots of the Old Gods article. 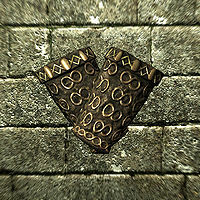 The Gauntlets of the Old Gods are a special version of Forsworn Gauntlets given to you by Kaie for helping the leader of the Forsworn, Madanach, escape Cidhna Mine. Alongside this wristwear, this armor set also includes a chest piece, a pair of boots, and a helmet. This item shares its appearance with basic Forsworn equipment, although it weighs one and a half a point less, and is considerably more valuable. The Gauntlets of the Old Gods have also been enchanted to fortify archery by twenty points. Tempering this item requires a piece of leather and the Arcane Blacksmith perk. For more information, see the Gauntlets of the Old Gods article. 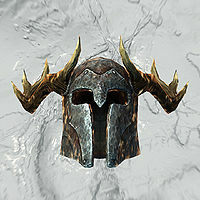 The Helmet of the Old Gods is a special version of a Forsworn Headdress given to you by Kaie for helping the leader of the Forsworn, Madanach, escape Cidhna Mine. Alongside this headdress, this armor set also includes a chest piece, a pair of boots, and a pair of gauntlets. This item shares its appearance with basic Forsworn equipment, although it weighs one point less, and is considerably more valuable. The Helmet of the Old Gods has also been enchanted to fortify magicka by thirty points. Tempering this item requires a piece of leather and the Arcane Blacksmith perk. For more information, see the Helmet of the Old Gods article. Predator's Grace are a pair of hide boots that are found next to a chest, above a waterfall, to the right of the Hag's End top level. These unique boots fully muffle the sound of movement the wearer makes, while also increasing the rate of stamina regeneration by one percent. Predator's Grace can be tempered with an iron ingot and the Arcane Blacksmith perk. For more information, see the Predator's Grace article. For more information, see the Shrouded Armor article. 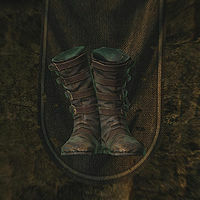 Shrouded Boots are the boots for a set of armor used by the Dark Brotherhood. Alongside these shoes, this set of armor also includes armor, a cowl, and gloves. These boots muffle movement by half a point, making silent movement easier. Tempering Shrouded Boots requires a piece of leather and the Arcane Blacksmith perk. For more information, see the Shrouded Boots article. 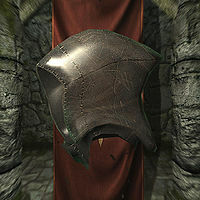 A Shrouded Cowl serves as the helmet for a set of armor used by the Dark Brotherhood. Alongside this veil, this set of armor also includes armor, boots, and gloves. This cowl fortifies archery by twenty points, increasing damage done with bows. Tempering a Shrouded Cowl requires a piece of leather and the Arcane Blacksmith perk. For more information, see the Shrouded Cowl article. 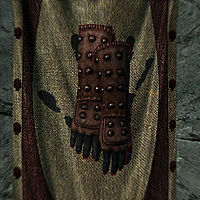 Shrouded Gloves serve as the gauntlets for a set of armor used by the Dark Brotherhood. Alongside these gloves, this set of armor also includes armor, boots, and a cowl. These gloves cause backstabs to do twice the normal damage, making these lethal sneak attacks even more effective. Tempering Shrouded Gloves requires a piece of leather and the Arcane Blacksmith perk. For more information, see the Shrouded Gloves article. 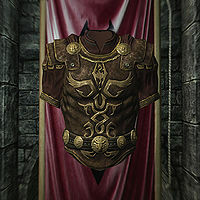 Thieves Guild Armor serves as the chest piece for the set of armor used by Thieves Guild members. Alongside this armor, this set of equipment also includes boots, gloves, and a hood. The armor has been enchanted to fortify carry weight by twenty points, allowing for more pilfering of valuables. Tempering Thieves Guild Armor requires a piece of leather and the Arcane Blacksmith perk. 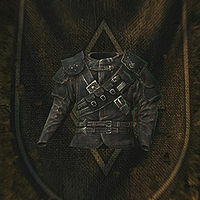 For more information, see the Thieves Guild Armor article. 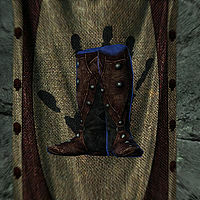 Thieves Guild Boots are the shoes for the set of armor used by Thieves Guild members. Alongside these boots, this set of equipment also includes armor, gloves, and a hood. The boots have been enchanted to fortify pickpocket chances by fifteen percent, making it easier to remove loot from people's own person. Tempering Thieves Guild Boots requires a piece of leather and the Arcane Blacksmith perk. For more information, see the Thieves Guild Boots article. 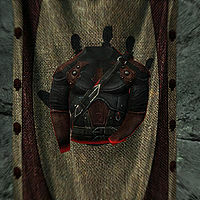 Thieves Guild Gloves are the gauntlets for the set of armor used by Thieves Guild members. Alongside these gloves, this set of equipment also includes armor, boots, and a hood. The gloves have been enchanted to fortify lockpicking chances by fifteen percent, making it easier to get into things that are otherwise inaccessible. Tempering Thieves Guild Gloves requires a piece of leather and the Arcane Blacksmith perk. For more information, see the Thieves Guild Gloves article. 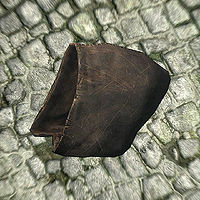 A Thieves Guild Hood serves as the helmet for the set of armor used by Thieves Guild members. Alongside this hood, this set of equipment also includes armor, boots, and gloves. The hood has been enchanted to fortify bartering by ten percent, allowing for better deals when trading with merchants. Tempering a Thieves Guild Hood requires a piece of leather and the Arcane Blacksmith perk. For more information, see the Thieves Guild Hood article. A Torturer's Hood is a helmet used by certain dubious figures, such as the torturer encountered in Helgen. It shares its appearance with a generic Thieves Guild Hood. This item is marked as "unplayable" and cannot be obtained in the original release of the game, but can be legitimately obtained and used in the Special Edition. For more information, see the Torturer's Hood article. 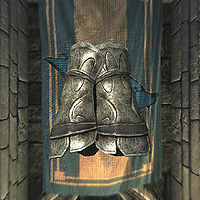 Tumblerbane Gloves are a special version of Shrouded Gloves given to you for refurbishing the Dawnstar Sanctuary with a master bedroom. The gloves can be found at the foot of the newly purchased bed. As the name suggests, these gloves have been enchanted to fortify lockpicking skills, making it twenty percent easier to break into chests. For more information, see the Tumblerbane Gloves article. 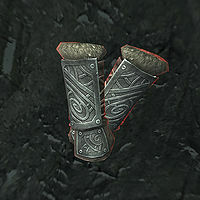 Ulfric's Bracers are the gauntlets used by the eponymous Ulfric Stormcloak. They share their basic design with fine armguards, although they are made out of different materials. For more information, see the Ulfric's Bracers article. This page was last modified on 13 March 2017, at 22:38.